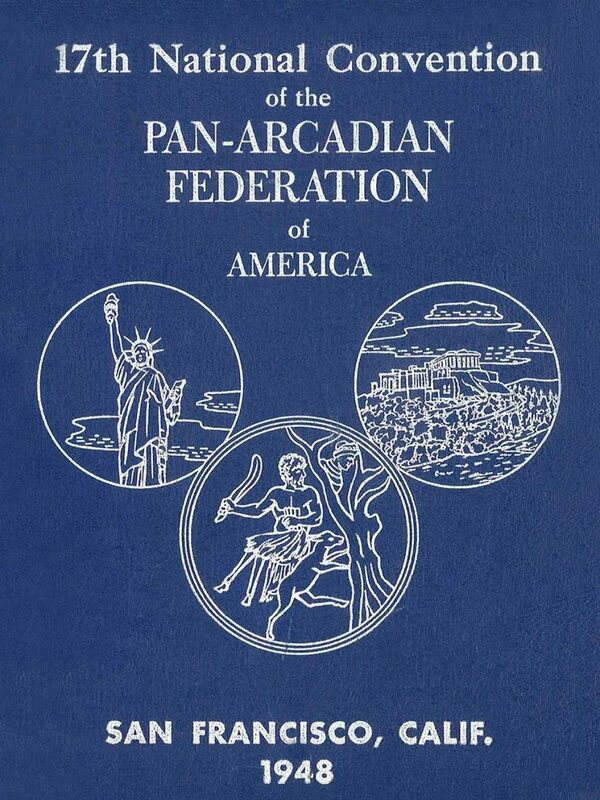 PAN is depicted on the inside of the Pan Arcadian Federation of America logo. He was the god of shepherds and flocks and lived on the mountains of Arcadia, according to the ancient Greeks. Shepherds regarded him as their protector who lived only in natural spaces. Especially the ancient Arcadians worshipped Pan and acknowledged him to be their own god. They dedicated shrines to him, such as the ones on Mount Lykaion and Megalopoli, they built altars and carried out rituals in his honor. According to the ancient Greeks, Pan usually roamed around the natural landscapes and mountains of Arcadia, such as Mount Mainalo, Mount Lykaion and Mount Afrodisio, as well as the Ladon river. He wandered amongst rocks, mountains and rivers playing tunes with his flute. He is actually thought to be the one who invented the syrinx, namely the flute, which is now called the “Pan flute”. His worship was widespread throughout Greece and beyond along with the worship of the rest of the Olympian gods. 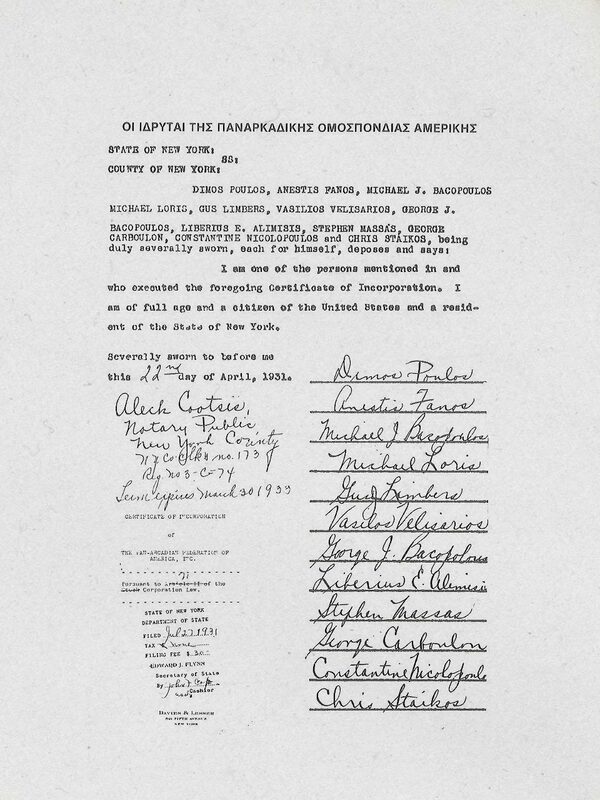 On April 22, 1931 twelve Arcadians living in the USA (Dimos Poulos, Anestis Fanos, Michael J. Bacopoulos, Michael Loris, Gus Limbers, Vasilios Velisarios, George J. Bacopoulos, Liberius E. Alimisis, Stephen Massas, George Carboulon, Constantine Nicolopoulos and Chris Staikos) decided to assemble all of the associations and signed an application through which the license for the foundation of the Pan Arcadian Federation of America was granted. In 1931, when the first steps were taken to unite all of the US Arcadians under one federation, the associations formed a new entity and founded the Pan Arcadian Federation of America. The “Old Man of the Morea” in New York that was founded by Athanasios Aggelopoulos, Nikos Bacopoulos and Alexandros Sioris was the first chapter and held a leading position. 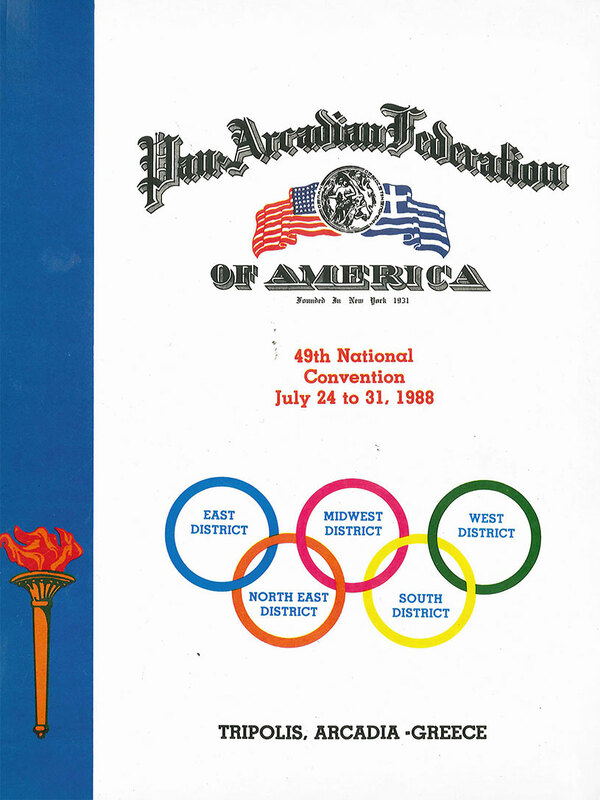 During the first two to three decades since its foundation, the Pan Arcadian Federation of America was the second largest organization in the USA after AHEPA (established in 1922). Arcadians hold many important positions and excel at various sectors. As a result, there are many important and well-known first-, second- and third-generation Arcadians in the United States. The federation had such a resonance that both American and Greek dignitaries attended the banquet of the 15th Conference of the Pan Arcadian Federation of America at the Hotel Astor, New York, on August 17, 1946 with Konstantinos Karamanlis, the Greek Prime Minister and later President of Greece, being one of them. During the ’60s, the Pan Arcadian Federation of America transferred its headquarters to Chicago, where the federation had acquired its own building. During the next decade, the Pan Arcadian Federation of America despite going through a small crisis, in September 1980, the Arcadians living in the USA realized that only through the alliance, collaboration and support of every Arcadian of the United States, the glorious past of the Pan Arcadian Federation of America could really soar. So, a few years later they held the first Panarcadian Conference. On September 26 and 27, 1981 the Pan Arcadian Federation of America resumed its activities at the Chicago Grand Plaza. In August 1982, the Pan Arcadian Federation of America held its 43rd Conference in Tripoli drawing power from its Arcadian roots. The Arcadians who live away from their homeland are always on the lookout and as American citizens they play a crucial role in strengthening the bonds between Greece and the USA. Through its initiatives, the Pan Arcadian Federation of America is present in the new global environment by constantly adapting to new conditions. 17th National Convention of the Pan Arcadian Federation of America. 49th National Convention of the Pan Arcadian Federation of America. 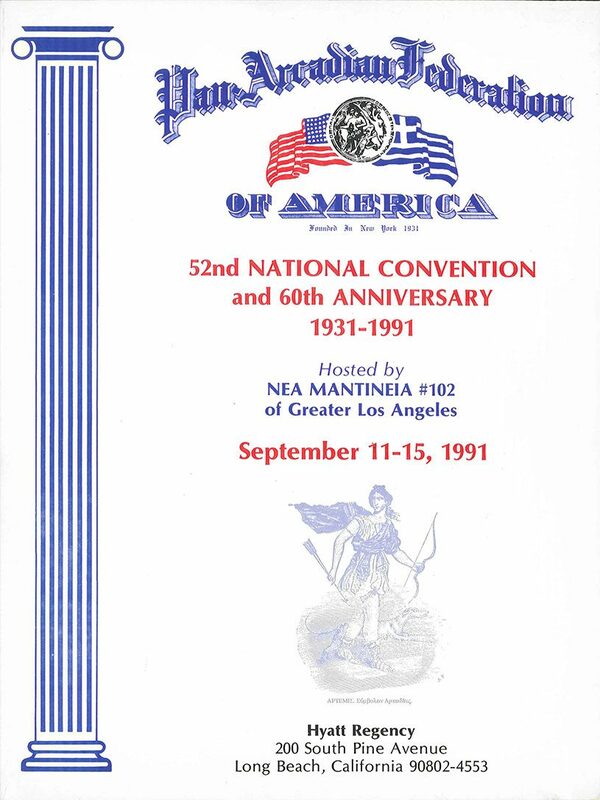 52th National Convention of the Pan Arcadian Federation of America. 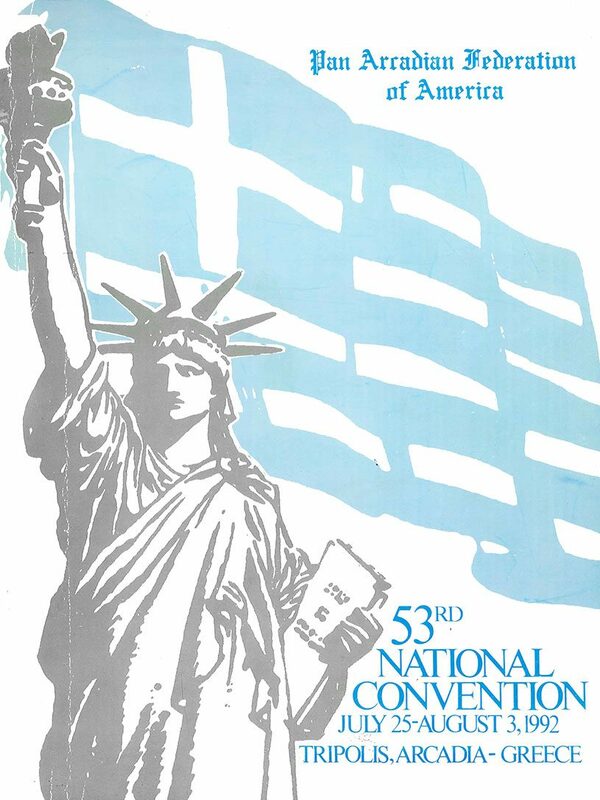 53th National Convention of the Pan Arcadian Federation of America. 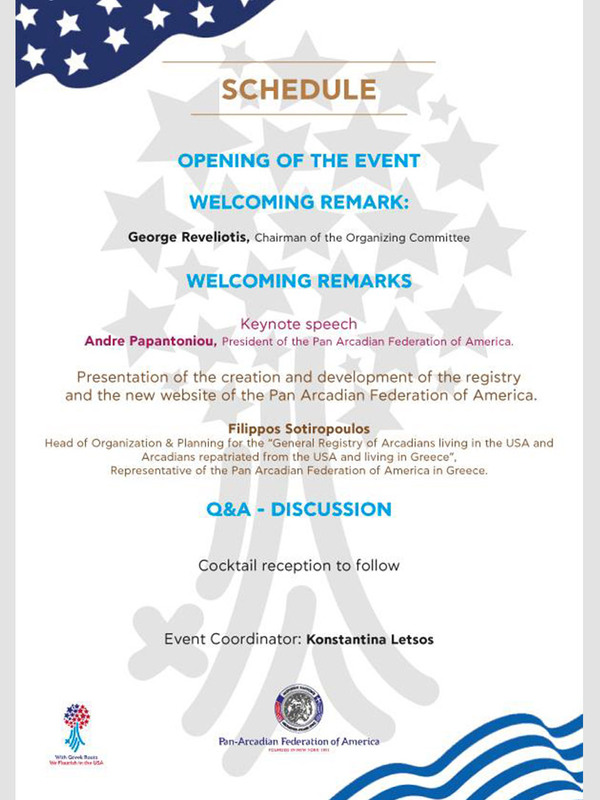 The Schedule of the presentation of the General Register of Greek - American Arcadians in the United States and repatriates from the United States to Greece, held on April 20 at the Metropolitan Club in New York. 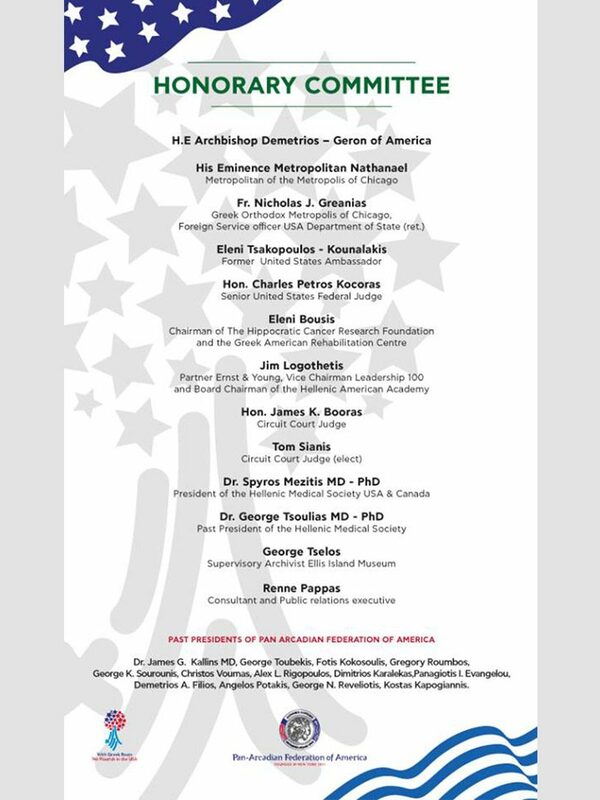 The Organizing Committee of the presentation of the General Register of Greek - American Arcadians in the United States and repatriates from the United States to Greece, held on April 20 at the Metropolitan Club in New York. 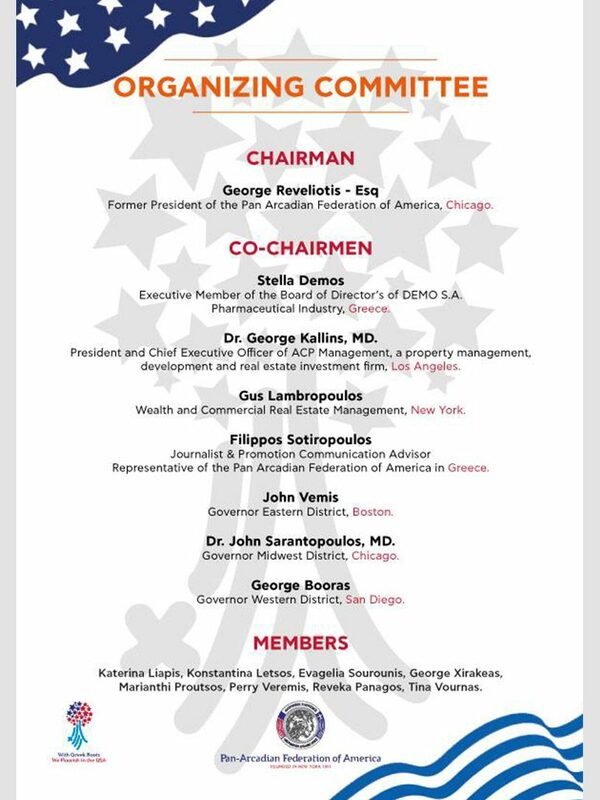 The Honorary Committee of the presentation of the General Register of Greek - American Arcadians in the United States and repatriates from the United States to Greece, held on April 20 at the Metropolitan Club in New York.